A love of books starts long before children can read - and its benefits can last a lifetime. 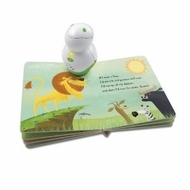 Using the same amazing touch technology as the Tag Reading System, the Tag Junior book pal is designed to encourage toddlers' natural desire to explore, while introducing preschool skills through playful book-based activities.The Tag Junior book pal is easy for parents and children to use. Parents can download audio for up to five books to the book pal, then let their toddlers explore. Each Tag Junior board book introduces a different preschool skill - such as the alphabet, counting or social play - through 24 playful activities and more than 130 audio responses. Open-ended questions and fun sound effects encourage children to take charge, as they touch any part of any page to bring words, pictures or activities to life. After their child has played, parents can connect the book pal to the online LeapFrog Learning Path to see their child's progress and get printable activities to expand the learning.